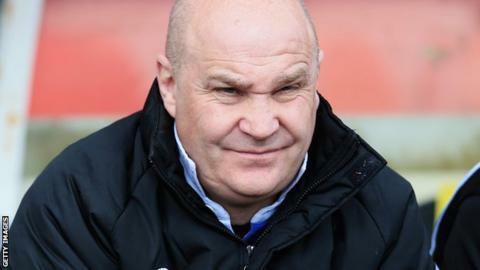 Richard Hill has resigned as manager of National League side Eastleigh with immediate effect. Assistant manager Chris Todd has been placed in charge of first-team affairs ahead of Saturday's league match away against Wrexham. Hill leaves the club 11th in the league table, and without a win in five games, having reached the play-offs by finishing fourth last season. In a statement, the club said it had "regrettably accepted his resignation". Eastleigh lost 5-2 at home against Dover on Tuesday, their second home defeat in a row and their fourth in the last five games. Former Watford, Oxford United and Northampton Town striker Hill met with chairman Stewart Donald and discussed how he felt the club would "benefit from a fresh outlook". After taking charge of the Spitfires in September 2012, Hill guided the club to the Conference South title the following season. They fell just short of promotion to the Football League last season when they were beaten by Grimsby in the play-off semi-finals.